The visitors are able to enjoy the exposition, which takes several storeys of the Bell Tower, and the observation platform, which is situated at a height of 25 meters. The 'first Moscow skyscraper' overlooks the Cathedral Square in the Kremlin and the old Zamoskvorechie district. Ivan the Great Bell Tower is a church in the Moscow Kremlin of 81-meter height. In 1329, the Saint John Climacus Church was built here. In 1600, when Russian tsar Boris Godunov reigned, one more storey was added to the 2-storied Bell Tower of Saint John Climacus. 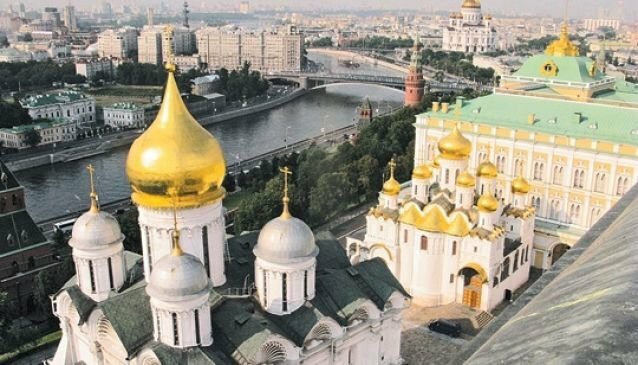 Till the beginning of XIX century, when the Cathedral of Christ the Savior was built, Ivan the Great Bell Tower remained the highest building in Moscow. In 1812, during the war with Napoleon several additions were demolished, but were rebuilt afterwards. Totally, there are 34 bells: Uspenskiy - the biggest one, Reut or Revun, Medved - the oldest (1501), Tatarin, Lebed and others. The Kremlin Museum ticket allows you to visit the Bell Tower, and every third Sunday in a month the entrance is free.